What are the advantages of solar energy? Whether you own a home, run a business, or manage a municipal building – there are many important advantages of installing solar energy panels on your property. Let’s review some of the biggest benefits. 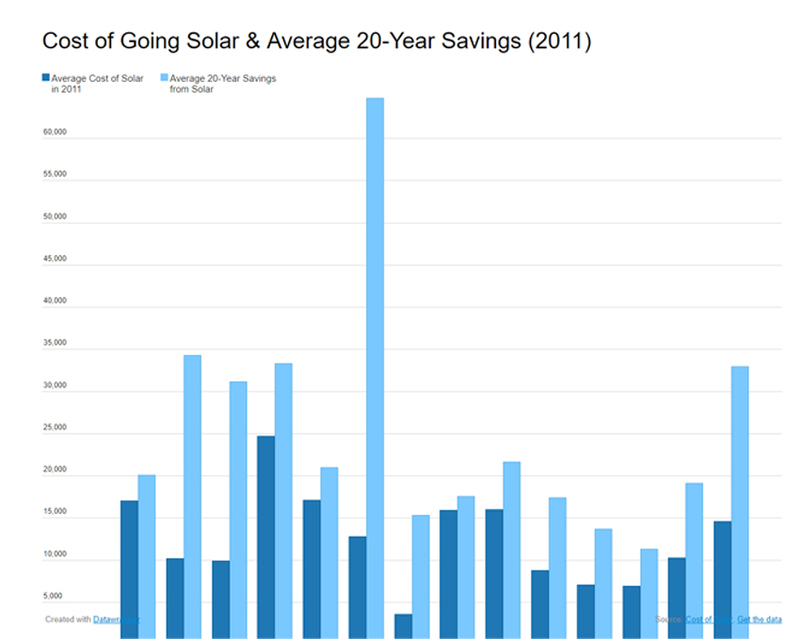 Probably the biggest advantage of solar energy is immediate electricity bill savings. No matter how small your installation, you begin receiving smaller monthly bills from your local utility company – from Day 1. 1 – Solar energy is a modular technology, meaning you can install as many or as few panels as you like – whenever you like. Each new kilowatt of installed solar capacity brings you bigger electricity bill savings. With a large enough installation, it’s possible to reduce your energy bill completely. Thanks to solar energy, countless Americans already pay $0 a month to their local utility. 2 – However large your installation, you can expect your electricity bill savings to grow with time. As utility rates increase, clean energy from the sun remains consistently free. 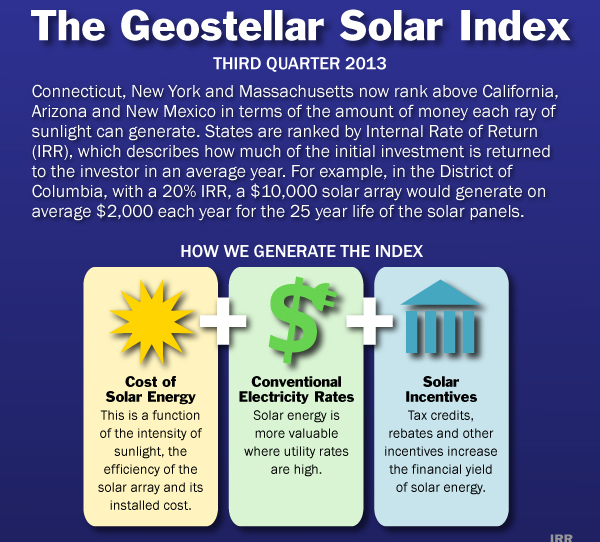 Solar is an investment that pays increasingly large dividends with each passing year. In the charts below, you can see some average solar system costs and estimated 20-year electricity savings from a study conducted back in 2011. The cost of solar has come down tremendously since then, so the average savings in many states should be better for people who go solar today than they were for people who went solar in 2011. But in the end, it’s not about averages — it’s about how much you can save. Depending on where you live, solar panels not only help you save on your electricity bill – they can also generate passive income. Many states, like New Jersey and California, offer generous renewable energy incentives designed to encourage solar photovoltaic (PV) adoption. If you qualify for these incentives, your local utility company actually pays you for the clean energy that your panels produce – either with direct cash or through credits. At that point, your electricity bill isn’t simply $0 – it’s in the negative. To learn whether you qualify for these incentives, run a free solar report on your property and get a free options consultation today. It costs you nothing to explore your solar PV options, and the potential upside is unlimited. Because solar energy helps you save on your electricity bill, it’s an investment that pays for itself many times over the 25+ year lifetime of your installation. But the advantages of solar energy extend well beyond electricity bill savings. Solar energy can also fetch you a much higher asking price when it comes time to sell your home. An average sized installation on a $500,000 property can add $20,000 or more to the retail value of your home – an amount that exceeds the average cost of most residential solar installations, meaning you could not only be reducing or eliminating your electricity bill but also getting 100% of your money back when and if you sell the home. By contrast, most kitchen remodeling projects only deliver returns of 60%. If you’re going to make home improvements, solar energy is pretty difficult to top. You enjoy lower electricity bills for as long as you remain in your house. And when it comes time to sell, you recoup 100% of your investment thanks to your property’s higher asking price. Let’s examine the final (and arguably most important) advantage of solar energy. But solar’s environmental dividends are no less tangible. Solar energy’s dividends don’t simply benefit you – the system owner. They benefit anyone who enjoys having a cleaner and more sustainable environment (which means everyone). To learn how you can take advantage of these economic and environmental benefits, request a free solar quote today.